The Dividend Drive: AT&T (T) vs. Verizon (VZ): Which Blue Chip Telecoms Play Should You Buy Today? AT&T (T) vs. Verizon (VZ): Which Blue Chip Telecoms Play Should You Buy Today? I only hold one real telecoms play: former monopoly, BT Group (BT.A), which I bought back in November 2014. I have on several occasions been tempted by Vodafone but until it is clear that its dividend is entirely safe by being covered by earnings I have held off. If I am interested in attractive utility-like telecom exposure beyond this, therefore, I have to look a little further afield. In January I compiled a couple of articles on AT&T (T) and Verizon (VZ) on Seeking Alpha assessing their FCF (free cash flow) performance alongside a number of tests I put to them. They both did OK-ish. However, the main reason for them was to get my eye in preparation for the big event: FY 2015 results! Late last month, in they came. So here I am going to compare the two in light of these results to see whether either are attractive investments right now. Both are therefore dominant players in an attractive sector with high barriers to entry. Despite the above similarities in wireless market share, the two companies have begun to diverge in their growth strategies. For Verizon, they are doubling down on the US wireless market selling out of their wireline businesses and taking on their outstanding stake in Verizon Wireless. In contrast, AT&T are looking for growth in Mexico and Latin America and also expanding their services into new avenues for example through the recent acquisition of DirecTV. Any decision to choose one over the other at the present time would be based on which company has the best plan to bring growth in the future. Let us see whether looking deeper into the companies fundamentals encourages me to change my view. However, the prospects for future growth have shifted dramatically since the AT&T acquisitions in Mexico, Latin America and DirecTV. Verizon's heightened focus on the slow-growing US wireless market in which it appears to have only limited market share gain left to extract looks likely to limit growth. DirecTV earned over $33 billion in revenue in 2014 with free cash flow sitting above $3 billion. 2016 will be the first full-year that these additional revenues will fully be reflected in AT&Ts results. Here I have to fall in favor of AT&T with revenue growth set to be stronger than Verizon's going forward. 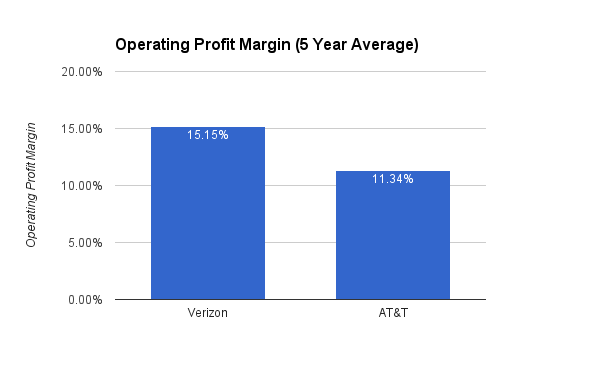 Year after year, Verizon has managed to maintain a margin lead over AT&T. I don't see this reversing anytime soon even if synergies from the DirecTV acquisition help to push AT&Ts margins higher in coming years. Verizon therefore has to pip AT&T here. First a quick note on wireless spectrum acquisitions. These are regarded as acquisitions rather than cash flow items in their financial reports. However, as noted on previous articles, this is something that should be borne in mind. I am in two minds as to whether they should be included in cash flow analysis. 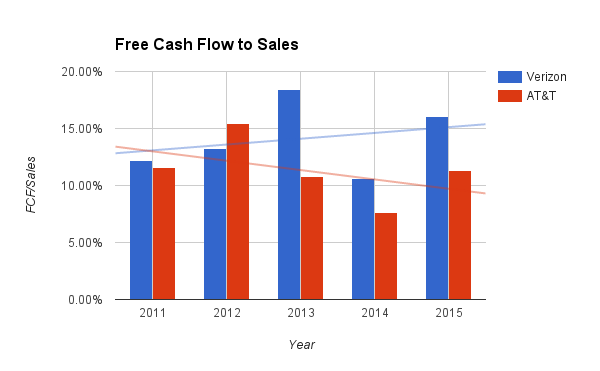 A separate article may follow in which I discuss ways of incorporating this in cash flow analysis. Right here, though, it will be omitted. What this means is that for every $1 invested in the companies last year, Verizon generated $0.16 in cash compared to AT&Ts $0.07. However, in AT&Ts case its CROIC was held back in 2015 by the fact that the DirecTV acquisition was only finalized in July 2015. 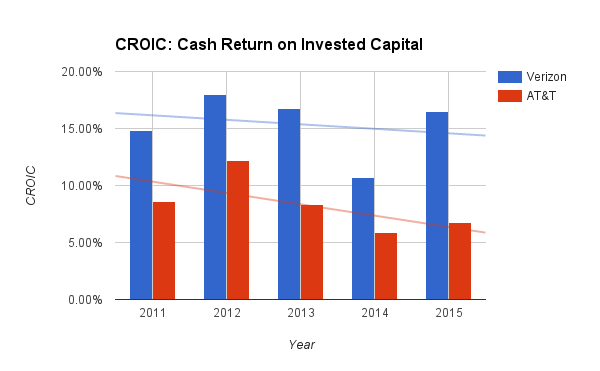 Something to watch in coming quarters is that this CROIC begins to edge higher (for instance, Verizon's purchase of Verizon Wireless in February 2014 affected its 2014 CROIC). I actually expect to see AT&T close this gap in coming quarters and years. Already, AT&T saw a strong year with their FCF "coming in higher than our increased guidance." This is great news and is indicative of some of the FCF benefits we will come to see from the DirectTV acquisition and others. Will they overhaul Verizon's lead over them? I am unsure, but it seems unlikely. On this front, Verizon has to be given a slight advantage over AT&T again. Both companies have been growing debt significantly over the last few years as they seek to unveil their new strategies. As such, they have kept in step with one another with both growing debt over the last five years at a CAGR rate of about 13% to 14%. I think we've been pretty clear that the next couple of years we want to get our debt levels back down to kind of more normal levels for us. We spiked them a little bit to get the spectrum bought last year and then also to do that DIRECTV deal. So we'll spend the next couple of years working the debt back down before we start talking about different capital allocations in terms of share buyback or anything of any magnitude. This will be attractive. Up to 2014 they saw an average debt load of between $66 and $82 billion. Presumably, this is the targeted debt levels they want going forward. Verizon has set their sights on debt reduction as well. In light of the deal with Frontier Communications (FTR) to sell them their wireline assets for $8.6 billion the CFO at Verizon, Francis Shammo, stated that they "intend to use the proceeds to pay down debt." As such, both should see their debt profiles improve in time. AT&T will require additional capital to support ongoing investments and finance its growing working capital needs. The negative ratings outlook reflects the risk that AT&T is unable to return to growth within its wireless segment such that leverage is sustained below 3.0x. Merger synergies related to the DirecTV acquisition will relieve some EBITDA pressure, but ongoing weakness in wireless revenues or a large asset purchase could place additional pressure on AT&T's ratings. AT&T's credit rating is therefore on probation until they prove that they can achieve wireless growth going forward. In light of this, Verizon's focus on its US wireless business seems wise. Here I would say that Verizon has a slight benefit over AT&T. Even with DirecTV's FCF taken on board for the full year in 2016, I expect to see their FCF coverage of debt remain below Verizon's. This is something to watch as the year progresses, however. Of course, one of the chief appeals of these businesses are their high and steadily-growing yield. AT&T is perhaps the most eye-catching in that it has both the higher current yield and--as a Dividend Aristocrat--the more consistent history. Nonetheless, in the near-term it looks as though this situation could reverse. As noted above, AT&T highlighted (perhaps with Moody's words ringing in its ears) that they planned to pay down debt before looking at further buybacks. The dividend is (as we will see below) safe. But anything extra is likely to be subdued for a while. As noted earlier, Verizon also plans to pay down their debt. Consequently, again, anything additional such as buybacks would appear set to be modest in the near future as a result. 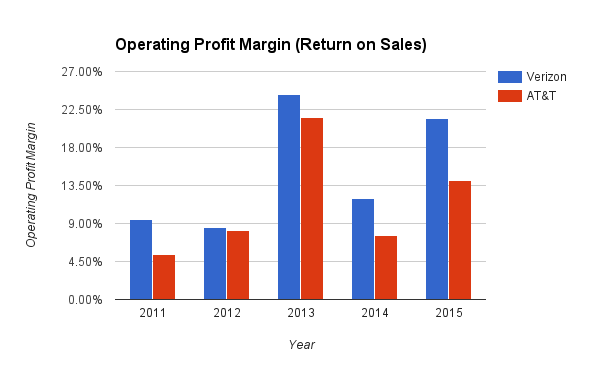 Despite AT&Ts more generous past, I suspect the two will share fairly modest buyback futures. Long-term, though, I suspect both will remain very shareholder friendly. The dividend for these businesses is all-important for investors. Last year, AT&T was very much the laggard in this regard. 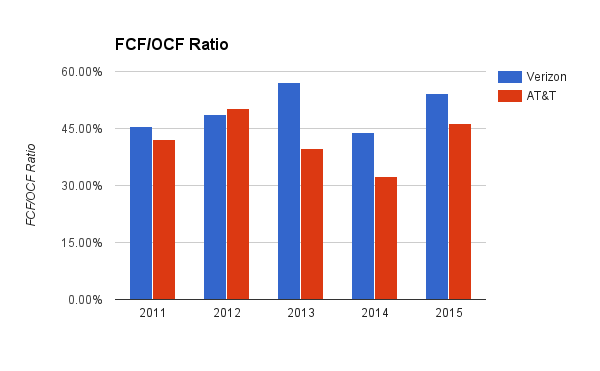 Despite a higher yield its FCF payout ratio was a hefty 94%. In contrast, Verizon's was a much more modest 68%. exited 2015 with a very strong balance sheet, and our dividend coverage has returned to a level that's very consistent with our historic norm. 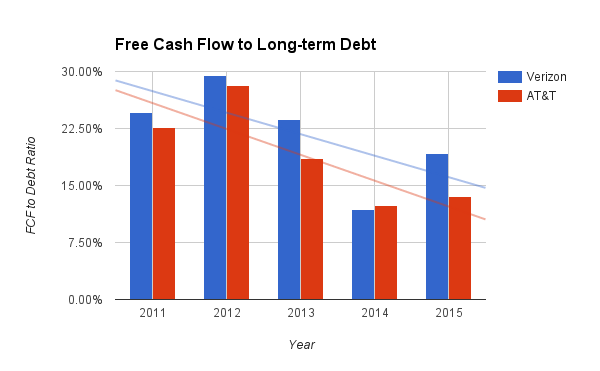 Capital spending will be in the $22 billion range ... and we expect our free cash flow dividend payout ratio to be in the 70s with a goal of growing free cash flow this year. 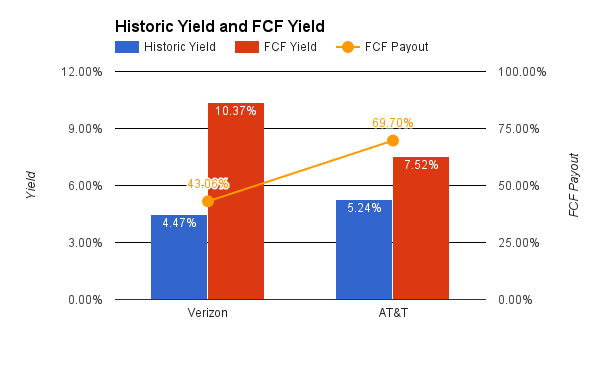 Nonetheless, AT&Ts FCF payout ratio is still well above Verizon's and their FCF yield remains well below its peer as well. Despite this, its current yield is noticeably higher. Both, as a result, have a attractive dividends depending on what you are looking for. Both, also, look safe over the medium-term. 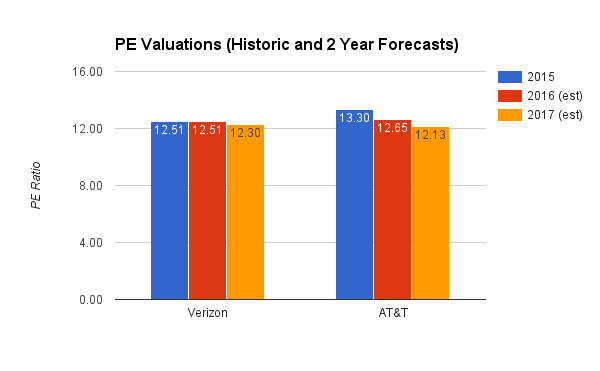 At present, AT&T looks slightly more highly valued than Verizon from a PE perspective. 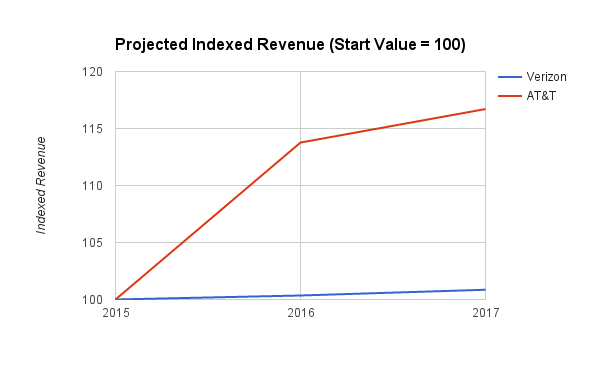 I can understand this, after all, with revenue growth expected to continue to grow rapidly over the next couple of years a higher valuation is fairly predictable. 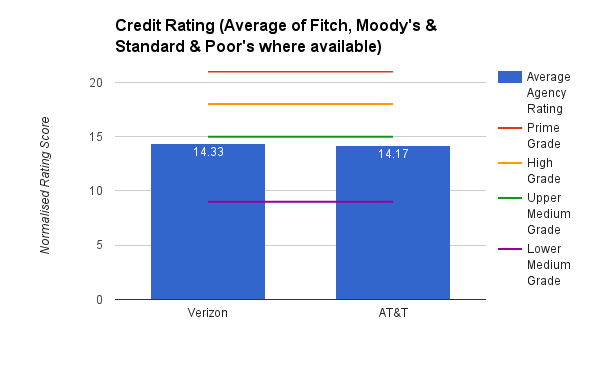 However, AT&T has consistently attracted a higher EV/FCF ratio compared to Verizon. Over the last five years it has averaged an EV/FCF of 18.4 compared to Verizon's 13.4. The above predictions suggest that the gap is closing. 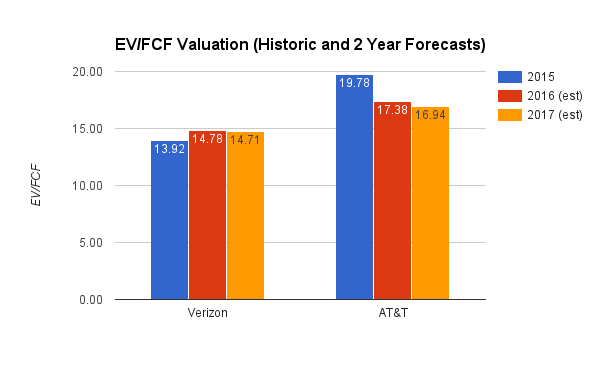 Verizon is set to trade ahead of its historic EV/FCF valuation and AT&T below it. Verizon will remain cheaper, but with slower growth prospects than AT&T I think this seems fair. Both are higher than my previous fair value predictions earlier this month. Interestingly, if Verizon was to fall to this price then it would produce a dividend yield slightly above that of AT&T. Again, with slower growth on the horizon I would say this was a fair reflection of its value. I must admit that I am left a little uncertain here. Both companies fundamentally look sound. As long as their intention to deleverage over the next few years comes to fruition their appeal will grow all the more. Verizon manages to produce some very impressive historical results. 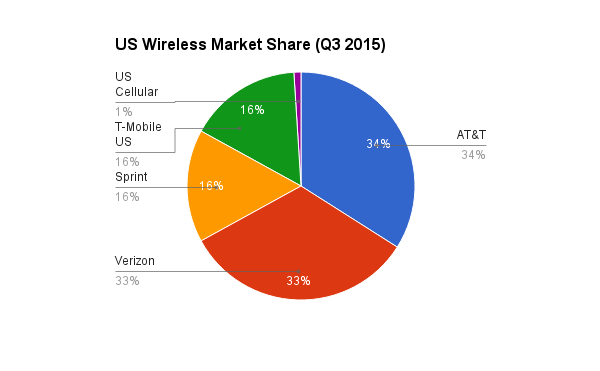 What is more, its strategy of focusing on the US wireless market has an appeal to simplicity. Such focus may provide them with the ability to continue to succeed in a US wireless market increasingly hit by pricing pressures and heightened competition. In contrast, AT&T's recent cash flow history has been less impressive than Verizon (though hardly disappointing). And its more aggressive strategy has a number of appeals in offering the potential for more rapid growth in the future. Both I think are taking risks. Verizon in the risk of being too defensive. AT&T in the risk of being too aggressive. Both may well, however, be risks which pay off over the long-term. Intuitively, AT&Ts more forward-looking strategy appeals to me more. 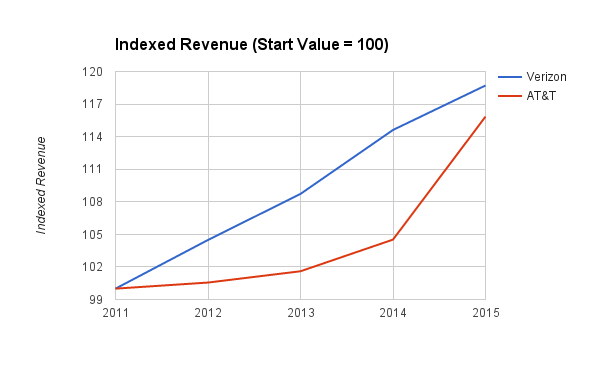 It has the opportunity to expand revenue for years to come. However, they have to ensure this occurs without losing sight of the core wireless and wireline business. Right now, I would probably go for AT&T partly for this reason and partly because it looks somewhat undervalued. However, its fundamentals also look like they should be set to improve in coming years. Dividend wise, too, it looks better. It is higher yielding and once again well covered by FCF. However, if Verizon's price was to fall down to around $40 I would happily add them to my portfolio also. The FCF yield is higher and it has proven itself an efficient cash generator which I doubt will be troubled in the near future. Both are attractive, stable, long-term dividend plays. With their diverging strategies taking them down very different routes, I think it could be a good time to consider accommodating both in your portfolio. But, for me, I would wait for Verizon's share price to drop a bit. With AT&T, you may wish to wait to see how the DirecTV acquisitions beds in and whether wireless growth comes out of Q1 2016 results. But right now, I would argue the company looks moderately undervalued. Right now though, the combination of BT Group (BT.A) and Sky (SKY) I currently have in my portfolio suits me just fine. Despite their lower yield they seem to have the more growth-focused outlook. We will see though! * I calculate predicted FCF by averaging the FCF/Revenue ratio from the last five years and the last FY and then multiplying the predicted revenue figures for the next two years by this figure to give a guide on FCF for the next two years. We own both companies in our family's dividend stocks portfolio. From our experience, both offer fairly stead yields in and around 5%. However, at current prices, I'd have to say that Verizon offers a better potential for some growth (in addition to the annual dividend payouts). Earlier this year when T was in the low $30s, I would have said AT&T, but my vote at the moment would have to go to Verizon. Thanks, AFFJ. They are very good companies in my eyes. My main concern is wireless spectrum purchases. The already intense competition has been growing even more so of late. It is unclear whether T or VZ are following the best course of action in light of this. It is possible both are! But as you say, the yields are excellent and provide some nice insulation. Smaller positions split between the two may be the best course of action right now. For long-term investors, though, things should look pretty good all around! Thanks for dropping by. I will update if I decide to go for either eventually!